In the last decades many foreign species of fish have been introduced by humans to the Caribbean region, mainly as a consequence of the pet trade for aquaria in the United States and particularly in the State of Florida. Among all of these species, only the Indo-Pacific Lionfish (Pterois volitans/miles) have succeeded in establishing local populations and expanding their range along the East coast of North America and the Caribbean Sea in only one decade. This outstanding capacity of colonization is what makes this exotic species also an invasive one. Lionfish are one of the top predators in the coral reef systems they inhabit. Therefore, the colonization of the Caribbean region by Lionfish is largely associated with a loss in native biodiversity, mainly fish and crustaceans. It has been demonstrated that, due to their pronounced voracity, Lionfish can reduce native fish recruitment in coral reefs by 79% in some environments in a few weeks. (Albins and Hixon, 2008; Green et al, 2012). Once established on a large regional scale, it is virtually impossible to eradicate Lionfish populations. However, it is possible to plan and implement a control program if enough resources are available to the management body of the invaded area. 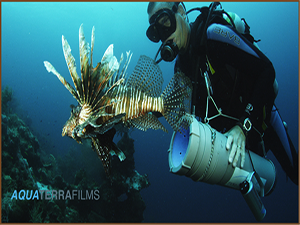 In Bonaire and Curacao, Lionfish were reported in October 2009 within only one day difference between both islands. Within six months, they had spread along the entire perimeter of the islands. Aware of the imminent invasion, the Bonaire National Marine Park started working on a plan to control the Lionfish population months before its arrival. In April 2009, the BNMP organized informative workshops for the public and started conversations with the Government. In September 2010, less than a year after the first sighting, the new spearfishing legislation was passed. Dive staff, visitors and local residents were involved since day one and, as soon as the first individual was sighted, the Lionfish Control Plan was put into action. Training workshops were organized, Lionfish became a topic in all dive orientations and more than 300 ELF tools were distributed to properly trained volunteers. Lionfish hunters have become quite skilled in targeting the invasive species. If you are interested in obtaining an ELF permit, please email the form below , including a copy of your nature fee receipt as well as a copy of your local lionfish hunting certification.